It’s official: Paris real estate is hot right now. The market is sizzling, according to new sales records and surging prices in 2017. A recent report by Notaires confirmed sustained price rises across the Île-de-France region between July 2016 and July 2017, where apartments have increased by 5.2% and houses by 2.2% on average. Paris represents a significant proportion of these accelerated growths, as the average price of old apartments in the capital rose by 6.8% in one year – reaching a record high of €8,790 per m² in July 2017. This figure is expected to grow further still and hit €9,000 per m² by November 2017, representing an annual increase of almost 9%. This news follows more detailed analysis last month of sales increases and price growth in Paris and the Île-de-France region. According to the latest data from Notaires, annual prices rises have been widespread across the capital, with the first 8 arrondissements now exceeding €10,000 per m² on average. 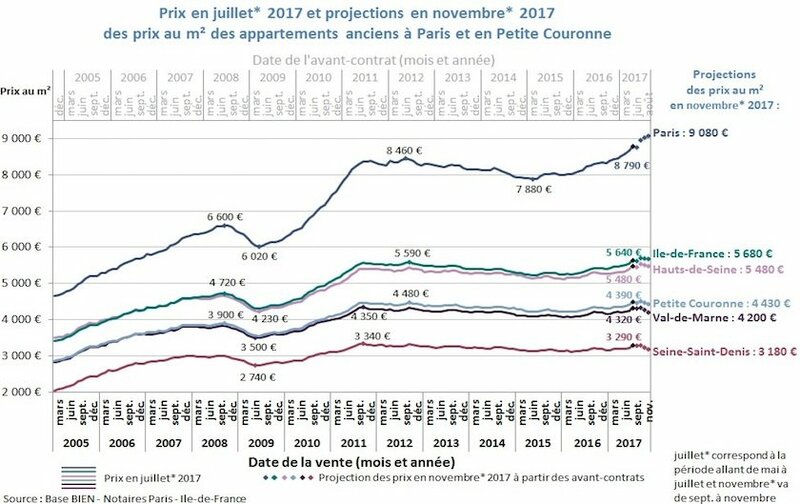 This growth has been highest in the 2nd arrondissement (+ 13.3%) and especially marked in the 6th and 7th, where many Paris Perfect properties are located and where average prices now exceed €12,000 per m². Meanwhile, some of the most affordable real estate in the city can be found in the 18th arrondissement at La Chappelle, where prices start from €6,350 per m². 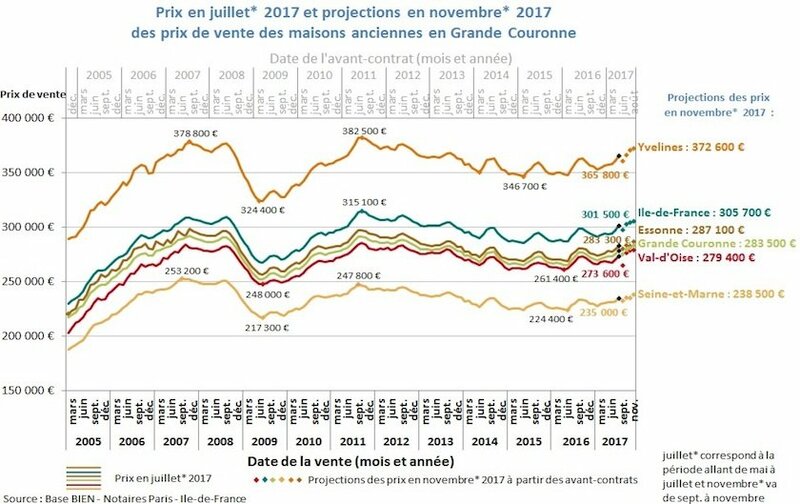 Although the price gap between the cheapest and most expensive areas in the Île de France region continues to widen as a result of this acceleration in the capital, the market as a whole remains dynamic. Official data from Notaires revealed a record number of sales of old homes across Île de France (excluding Paris) during the second quarter, exceeding quarterly sales figures for the past 20 years. Paris’ dynamic market conditions, attractive interest rates, and heated competition has led to an increased number of flash housing sales. As recently reported by Le Point, housing in the capital is now typically on the market for less than a week before receiving an offer, and buyers are offering the full asking price – sometimes without even visiting the property first. And while a slight lull is predicted elsewhere in Île de France over the coming months, the real estate scarcity effect will continue to feed the flame in Paris. False economy in the suburbs? Escalating property prices and flash sales in Paris means an increased number of buyers looking to move beyond the périphérique. But is this necessarily the best investment? 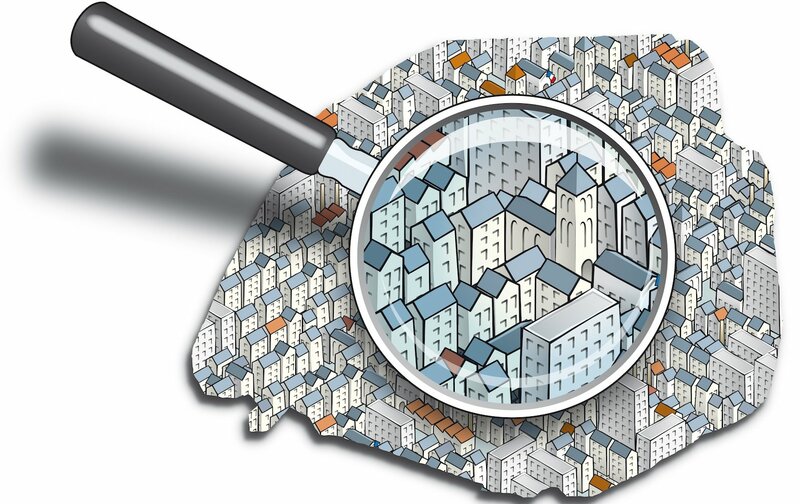 According to a recent report by Notaires, price differentials between the peripheral districts of Paris and its surrounding suburbs are widening. While some communes to the east and west, such as Montreuil and Levallois-Perret, have managed to buck this trend, gaping discrepancies to the north-east of Paris should not be ignored. For example in Aubervilliers, property prices increased by only 15% in ten years, while neighboring Pont-de-Flandre in the 19th arrondissement saw prices rise by up to 50% during the same period. Forecasts predict these differentials will inevitably worsen, as Paris prices continue to accelerate while suburban price growth is expected to become more moderate by November 2017. Buying beyond the périphérique could, therefore, be a risky business: overall, prices may be cheaper – but there is little guarantee of return on your investment or what the future may bring. 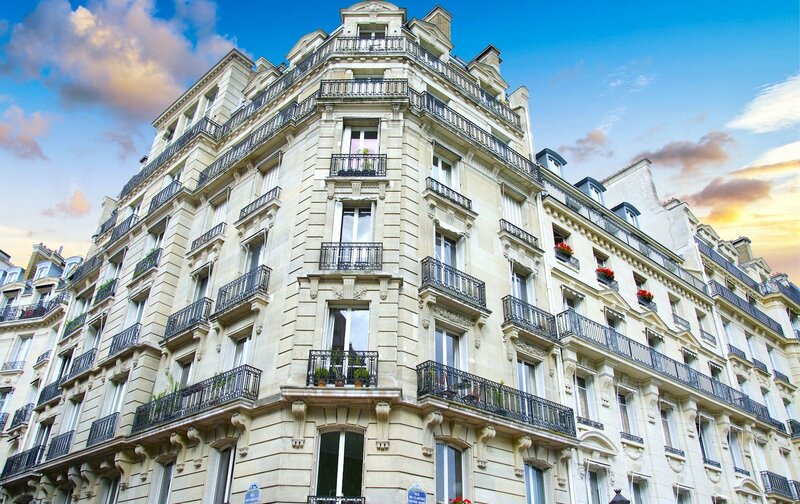 Our advice remains the same: buy in the most sought after locations in central Paris. As seen above, they increase most in up markets, while retaining their value during downturns. 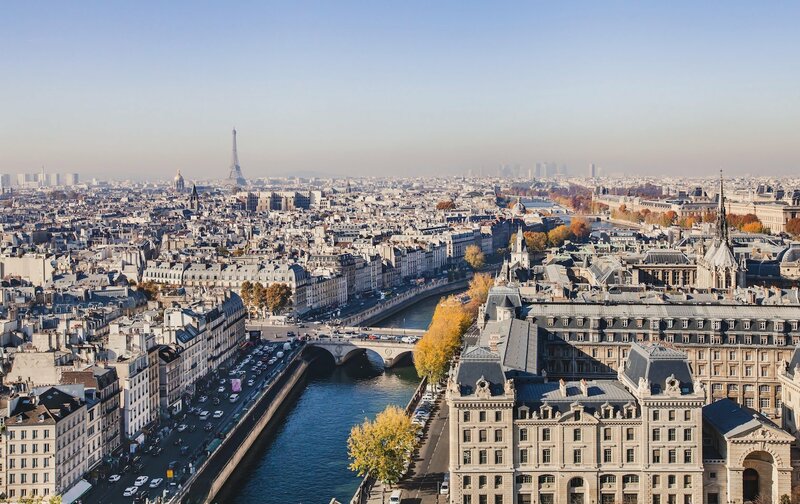 Paris is attracting a great deal of interest from international investors at the luxury end of the market, having been recognized by Savills as the eighth most expensive city in the world. 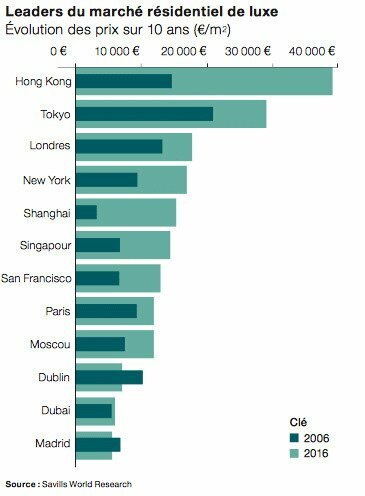 According to their recent spotlight report, opportunities are ripe with prime real estate in prestigious Paris neighborhoods, 32% cheaper than in London and 69% less than in Hong Kong. Yet while international buyers currently make up only 9% of the market (compared with 14% in 2008), confidence is growing and savvy investors are preparing their move. A 2015 report by Sotheby’s placed Paris among the top four destinations for luxury residential investment worldwide, with record low-interest rates on French mortgages cited as one of the main attractions. Other pull factors include a relatively stable market, the city’s global reputation for cultural excellence – and of course, its unique Parisian charm. The next few years should witness an influx of international investors, and who can blame them? Paris is timeless, and a pied-à-terre here will never go out of fashion. Have a look at some of our latest listings on Paris Perfect. Are you interested in investing in Paris real estate? At Paris Perfect, we can help you find and manage a property that’s right for you. Contact us [email protected] for more information about how we can support you. Posted on Monday, October 30th, 2017 at 9:10 am in Apartments for Sale, Paris Perfect News. You can follow any responses to this entry through the RSS 2.0 feed. You can leave a response, or trackback from your own site. There goes my dream of owning a flat in the Marais 🙁 I wish Paris wasn’t so expensive – I would move there in a heartbeat!